When a pregnant woman comes to American Adoptions and is considering adoption, there are a lot of decisions she must make; most importantly, choosing the right family to raise her child. She will likely spend countless hours poring over adoptive family profiles searching for the couple that her baby will call his or her parents. She will receive stacks of print profiles, each one outlining a potential family—and one of them might be yours. The value of a quality print profile cannot be overstated. Most likely, it will be the very first impression of you that a birth mother gets, and you want that impression to count. It should capture your personality, interests, lifestyle, and—most importantly—excitement to adopt a child. Every profile is unique and reflects the qualities of that particular family, but there are certain guidelines that every profile should follow to be successful. Prospective birth parents want to see active shots as well as posed photos. Don’t include several pictures of yourselves making different poses in the same place on the same day. Select photos that show your hobbies, activities, family and friends, as well as pictures from a recent family photo session. While you don’t have to write a novel, you do want to be as detailed as you can. The more information you give about your home and lifestyle, the easier it will be for a woman to envision her child in your family. There is no need to be formal or hide your feelings; birth parents want to see the emotional side of your story and connect with you. She is making a difficult and emotional decision, and it will mean a lot to her to know that you are compassionate and thankful for the choice she may make. When a potential birth mother reads your profile, she wants to envision what her child’s everyday life will be like. Be sure to talk about things you do on an average week night or weekend, as well as the fun vacations and holiday traditions you may have. Whether it’s an interesting hobby or the funny way you met your spouse, the unique things about you can make a lasting impression on a potential birth mother. That picture of your cross-country road trip might be special to you, but if it’s several years old or you can’t see your face in it, it may not look great in your print profile. Your pictures should help your profile look clean and give potential birth parents an idea of what you’re like right now. Birth parents often report that overdressed families look unapproachable or cold. Dress in your everyday clothes to give an honest reflection of your daily life. A woman doesn’t have to commit to adoption in order to view profiles. If you applaud her for her decision or talk about your excitement to raise her child, you could potentially put unwanted pressure on her. Gender-specific language can be unappealing to birth parents, even if their child is your preferred gender. It’s easy to feel like your profile has to be perfectly polished or to compare yourself to others, but the truth is that there is no secret formula for a successful profile. Just be yourself—your personality and passion to start a family are what will make your profile stand out. 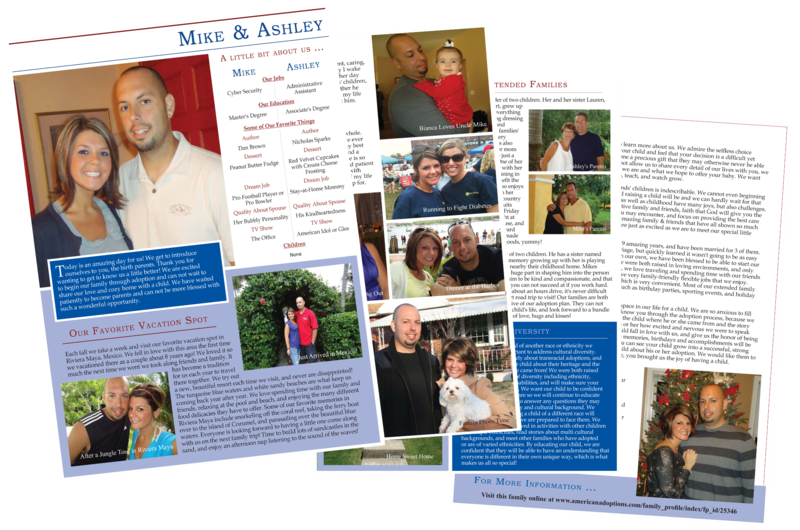 Remember, the goal of your print profile is to help birth mothers envision their child as a member of your family. The adoption process takes a lot of time, consideration, and hard work, but your love for the child you haven’t yet met makes it worth it; let that love show, and your profile will shine!